You will find apples grown in every garden. 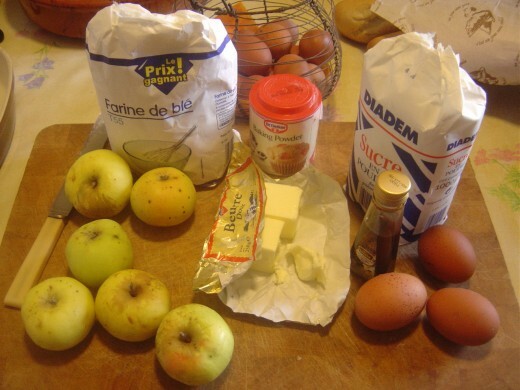 Limousin is famous for apples and pears and this traditional Limousin flognard recipe is easy and delicious! 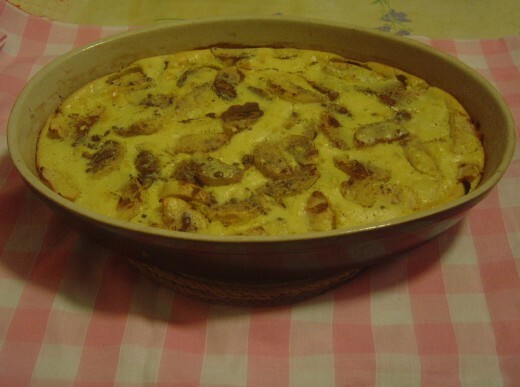 Flognard, like the better known clafoutis, is fruit baked in a sweet batter but while clafoutis is made with apples or pears, clafoutis is typically made with cherries. 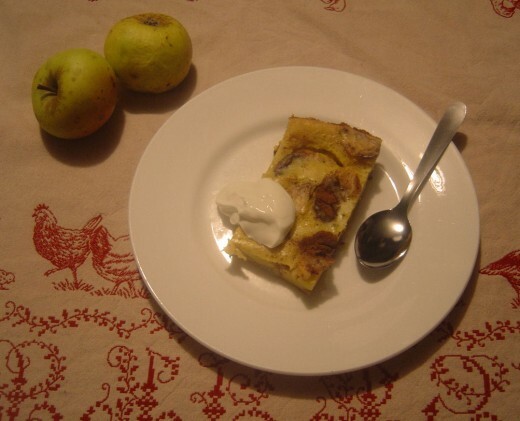 In Limousin you'll be offered Flognarde, a speciality of the Limousin and Auvergne region, in restaurants and the homes of your hosts alike - they do love their apple, pear and cherry puds in this part of France. 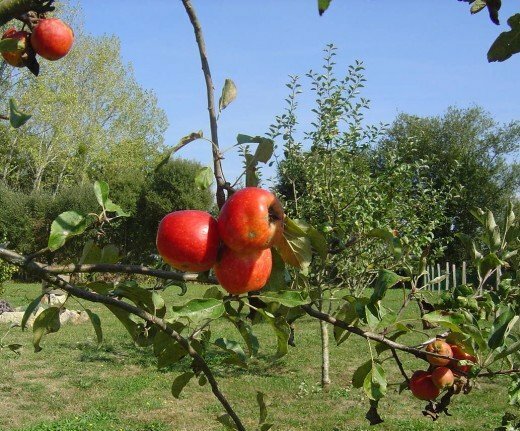 The orchards of Limousin are a wonderful sight and many sell apples and pears direct to the public. Here you can often pick your own, choose form perhaps 8 - 15 varieties, try juice made from freshly crushed fruit, or sample many of the other local delicacies; honey, walnuts, chestnuts, chestnut liqueur and foie gras. Needless to say, there are many fabulous local recipes for cooking the fruit. At Les Trois Chenes Chambres d'hotes, we try to serve local French food, and, if possible, buy from local producers the things we don't produce or grow ourselves. Apples paly a large part in the autumn festivities at the little town of Chabanais, about fifteen minutes from Les Trois Chenes and just over the border into the Charente area. 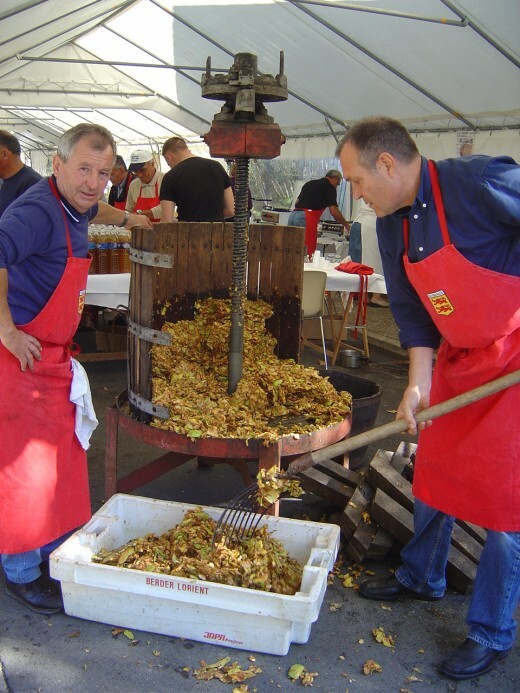 Called 'Les Journees de la Quintinie', the Chabanais fall festival takes it name from Jean-Baptiste de La Quintinie, the 'Potager du roi' under King Louis XIV. 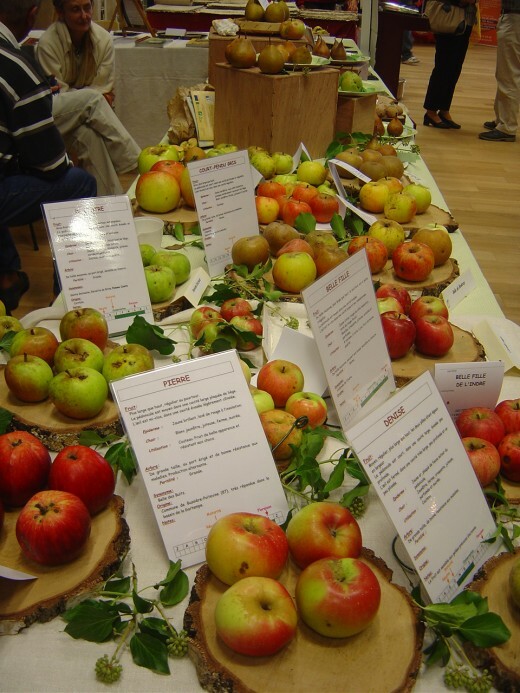 The pictures to the right and below show the variety of apples and pears on display, and the commune crushing apples for fresh apple juice or cider. We bought two litres of the most fabulous, freshly crushed, absolutely pure apple juice. Local fine food, wines & spirits, cooking courses, wine tasting and culinary tours. FREE FOR ADVERTISERS! I did this by sieving the flour, baking powder and salt together into the bowl. Adding the butter, microwaving it until just on the point of melting and mixing this into a roux, (which just means flour and fat mixed together to form a paste!) 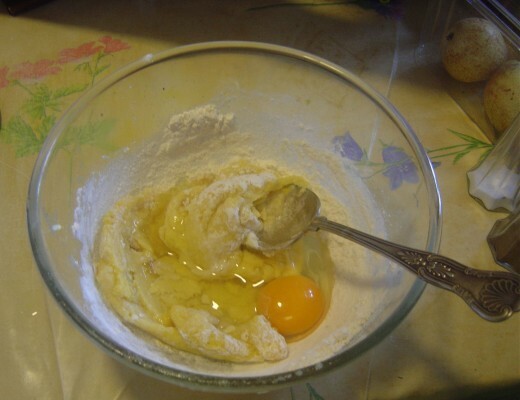 Then I added the eggs, one at a time mixing in each one carefully to keep the texture smooth. After that I added the milk, a little at a time, and again, mixed carefully. Finally I added the alcohol, vanilla and sugar. 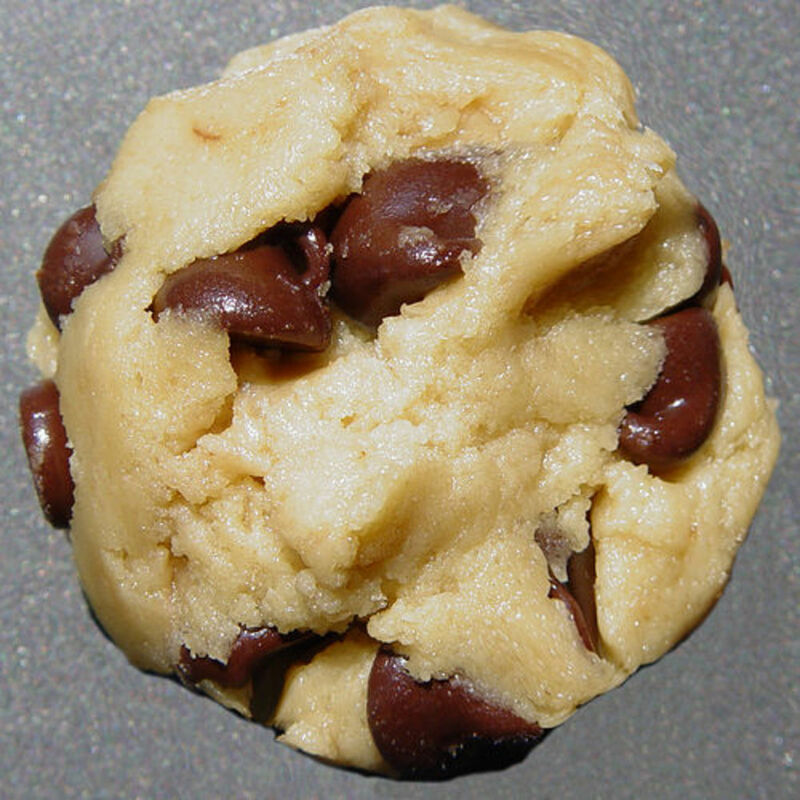 If your mixture goes lumpy, don't despare. Pour the mixture through a sieve and then press the lumps through the sieve too. 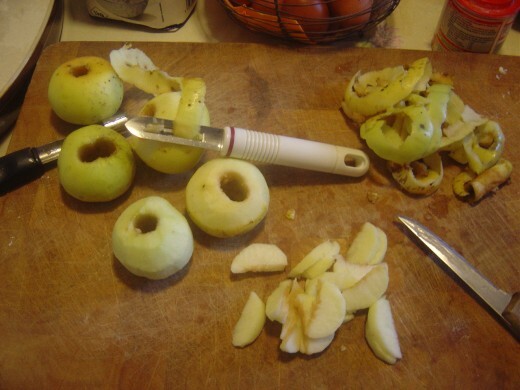 Put the sliced apple into a buttered and floured dish, this is to help to prevent the flognarde sticking. You can take a bit of time to arrange the slices prettily if you like - I'm afraid mine was for the family this time and it all goes down the same way - and fast!). Then sprinkle with cinnamon. 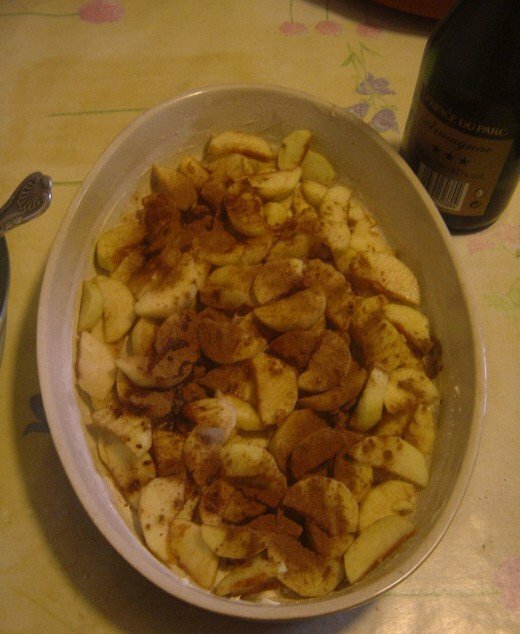 One of the recipes I looked at - 'La Pomme du Limousin, Terroir & Gourmandises', produced by the AOC Pomme du Limousin, listed in the ingredients 1 nuage de cannelle en poudre - a cloud of cinnamon, which I liked. Then pour over the mixture, and bake in a pre-heated oven for about half an hour. 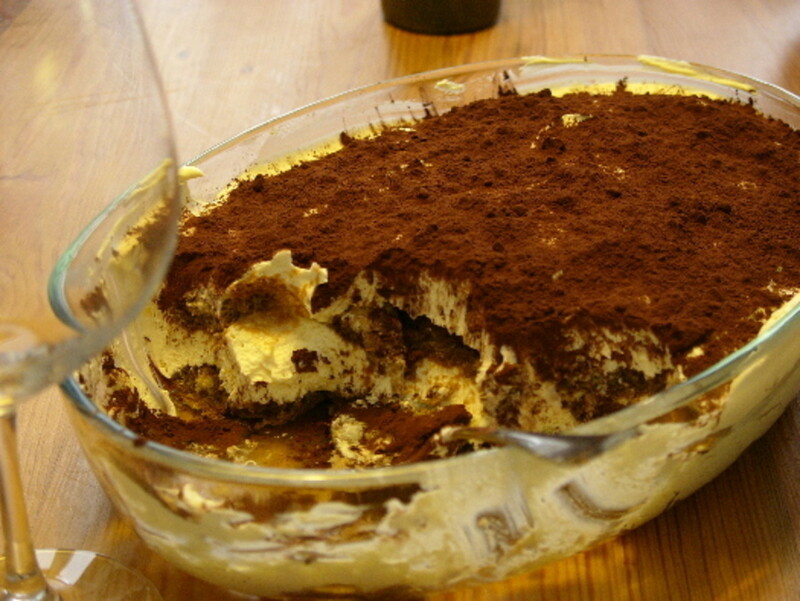 It is ready when the mixture is just solid to the touch in the very centre. You can then dust the dish with icing sugar or granulated sugar and serve with creme fraiche, ice cream or any topping of your choice! 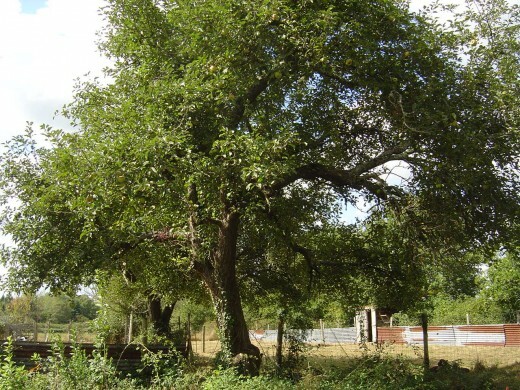 We have two wonderful old apple trees in our hen runs which give us a magnificent crop of eating apples. There is a cooker in the peach orchards, and another at the bottome of our hay meadow. 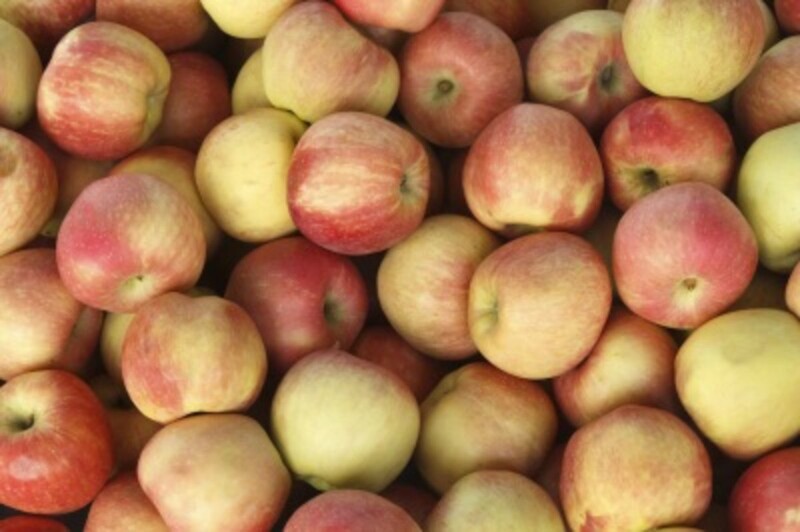 From September to December, we have so many apples we don't know what to do with them. If we ever see a press for a reasonable price, we'll definitely be making our own apple juice and cider. 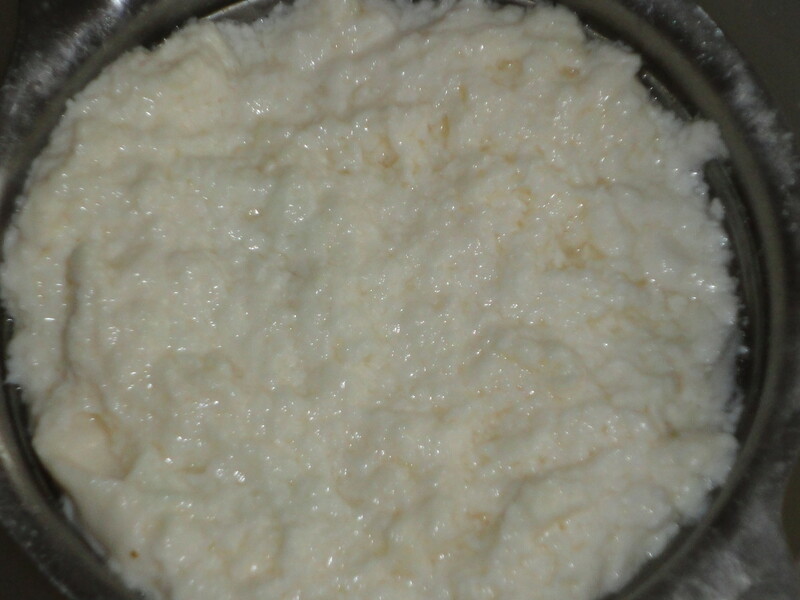 Have you ever made or tasted flognard? 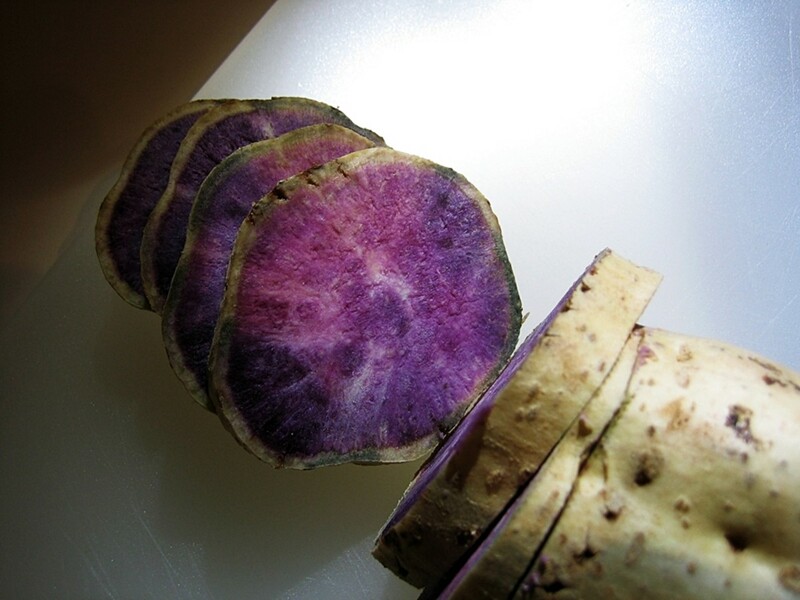 Pomme du Limousin. Find the book La Pomme du Limousin on this site. Painting holidays, self-catering holiday cottage and Bed and Breakfast accommodation in Limousin, rural France. I've added american measures from one of my cookbooks, but I don't know how you express small measures. I've translated 40g as .18 cups. Is that ok? 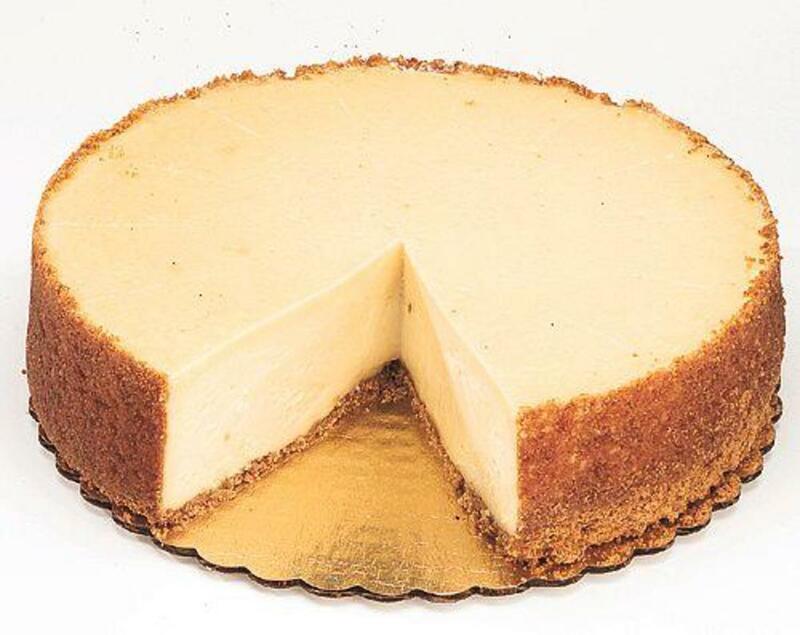 Like many of these traditional recipes, it is very forgiving, so don't worry about slight discrepencies. Do arrange your apple slices artistically - not just thrown in like mine - I was in a rush to get it in the oven! Good luck. Thanks :) I have to bake something from Limousin, France for a food project I am currently working on for my French III class. 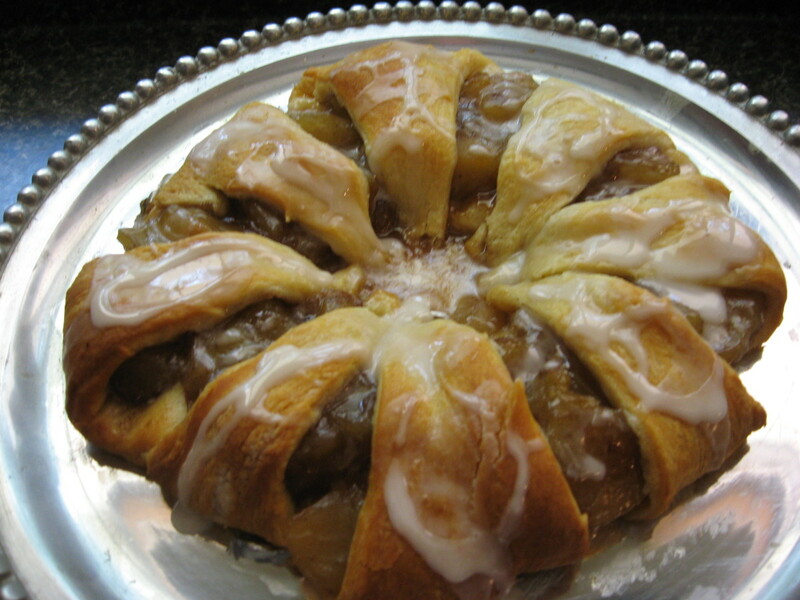 I appreciate being able to use your recipe; I'm sure my class will love it :) Also, is there a website that you know of to convert some of the measurements into ones that are more commonly used in America? Jacqui, I think this would serve 6 - 8 people. Most of my recipes come from old books or neighbours and I must be more organised about taking notes as I cook them and filling in all the 'official' bits like oven temperature etc. So many of the recipes have no quantities and say things like "put in a hot oven until cooked". Thanks so much for these few vowels of appreciation! 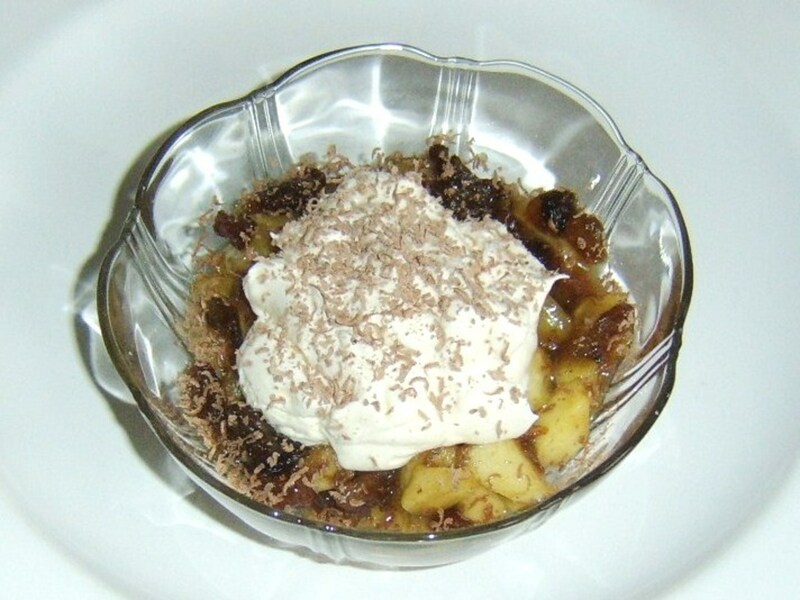 I would love to have you share this recipe (and any others you would like) with my readers!